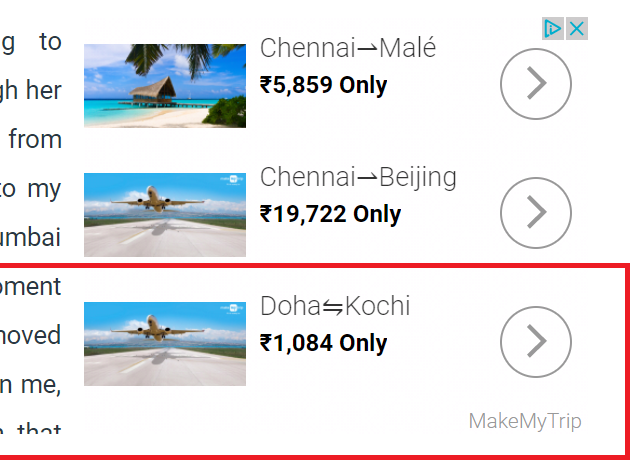 I've been observing that MakeMyTrip is wasting its money on useless advertisements. Many of the ads are either misleading or purposeless. Whoever is managing the marketing spend is either careless or has some hidden agenda. 1. 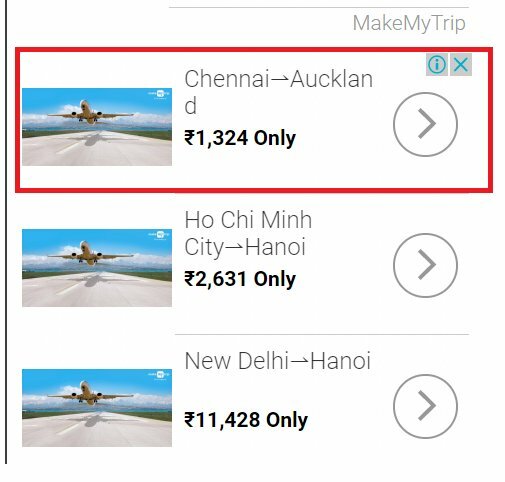 Click baits with unrealistic fares: Chennai- Auckland for Rs 1324- really? 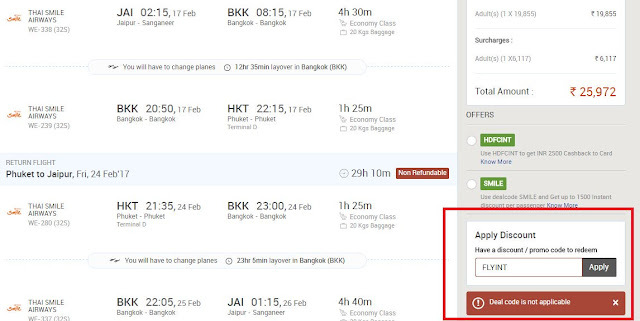 I saw below ad multiple times- showing insanely low fares, so that user clicks on the ad and goes to the website. It is impossible for any airline to fly you to Auckland for Rs 1324, even after assuming this is one way fare n taxes extra etc. The cheapest one way ticket to Auckland from Chennai would cost around 10 times more- INR 11000 to 12000, during an Air Asia sale, if you manage to get the dates n fare right. So what exactly MakeMyTrip is hoping to achieve by this ad? Once landing there there's no way of knowing for which date the shown fare is applicable. Most users will abandon after couple of attempts. May be MMT hopes of the 100 people who click the ad, at least 5 to 10 will forget the amount they saw in the ad and book at whatever real fare shown to them. 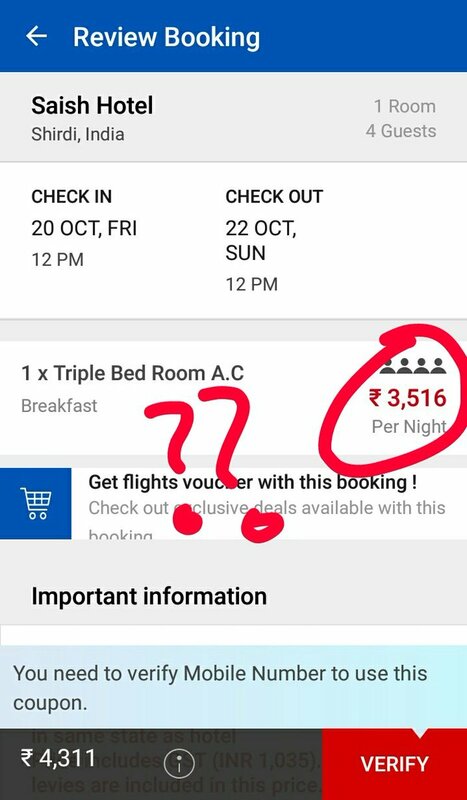 Above: Another click bait, spotted on 23rd October- Doha- Kochi 1084 Rs only! 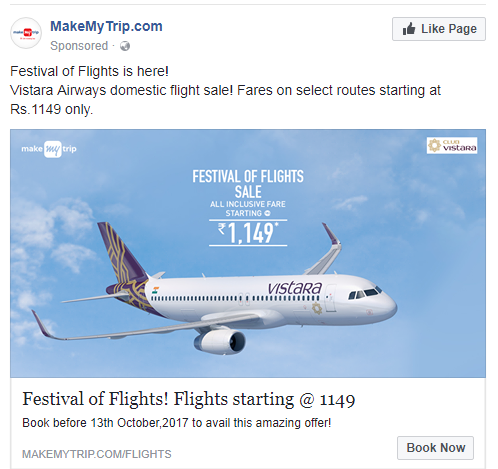 Vistara sale ended yesterday (13th October) but MMT is still advertising it today (14th October). May be they are careless, may be they just want some traffic. But if you want to avoid wasting your ad money, you should sync your promos with airline sales. Next day onwards advertise something else. Else customers think they will get low fare, but when they try to book they will never see a low fare. MMT advertises massive discounts for the destinations you might have simply searched on google, hoping that you'll book your flight with them. But their advertising is often far from reality. 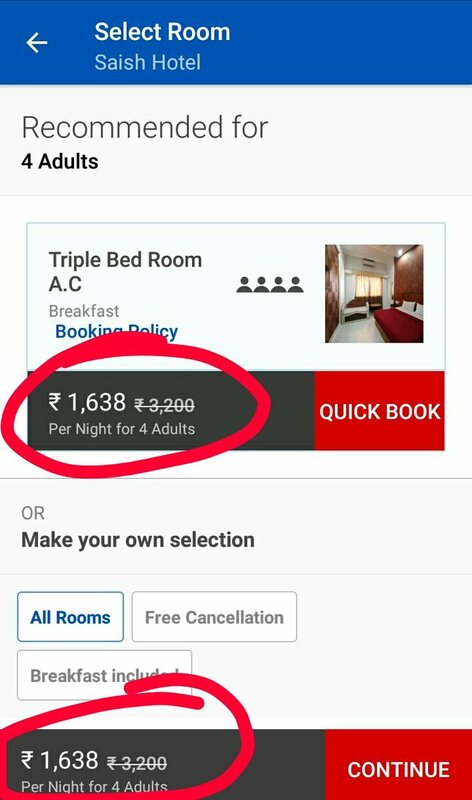 Fellow blogger Arti (who blogs at http://www.myyatradiary.com/) has shared below screenshot, which shows room price doubling in next screen. This hints that practice may not be limited to airfares alone. But this one though is right inside the website, not in an ad. I made couple of tweets to MakeMytrip highlighting these blunders, but never got a response. Those handling twitter accounts are probably junior staff/outsourced agency staff not qualified/authorized to respond to above situation. If these were one off incidents I would have ignored. But over past 1 year, I've seen this happening again n again. Either they're not testing the ads enough or simply don't care. I have noticed many such instances, but didn't take screenshot all the time. A misleading ad may make customer click on the ad and visit the website, but it can't make him/her complete a transaction (Booking). Customers are not fools- if they don't see the advertised benefits they will simply close the tab. Lost trust. Now I don't trust MMT ads in its face value. Have to be on caution and cross check if they really mean what they're advertising or in most cases, simply ignore the ad as I know it is probably fake and not worth my time. I don't know why big folks at Make My Trip can't be more careful about the ads they release or the money they spend. May be it could be inter-department politics. Let us say there's a marketing team whose mandate is to generate leads. They have a set marketing budget (huge sum), have to spend it and generate traffic for the website. Their success is measured on the number of clicks generated, not necessarily on number of bookings created. 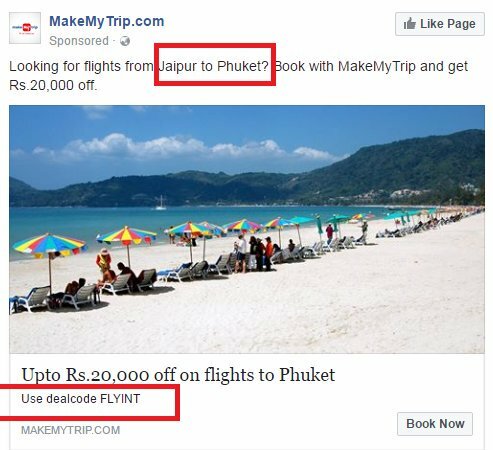 This means that marketing team somehow needs to get visitors to click on the ad and make them visit the makemytrip.com website. There after they don't care. By advertising cheap fares, discounts etc people will click on the ad and visit the site, marketing team's objective is met. They can claim they generated several lakh leads. It is another story that most of those leads don't covert because customers do realize that they've been tricked- whatever is advertised they are not able to really take advantage of. This is not good for MMT or any other website. Of course flight ticket sale is a tough job- margins are low, so much competition and many prefer to book directly with airlines. New drama needed every now n then to grab attention. But deception will work only short term. Once customers realize that they're being tricked, in long run they will ignore the brand and both traffic and sales will nosedive. I suggest Make My Trip correct its ways, pullout misleading ads/take corrective measures.